From where I can get black and white Bizhub 215 toner and how much does it cost? The Bizhub 215 printer is relatively new to market and as yet we're unable to get stock of the genuine Konica Minolta TN-118 toner cartridge that goes in this machine. Please accept our apologies. As soon as the item becomes available we'll bring it into stock. Current prices will be listed on the website but may be subject to change. The all-in-one Konica Minolta Bizhub 215 aims to increase productivity in the office and subsequently lower printing costs. This unit offers a monochrome laser printer and copier plus a coloured scanner. The Bizhub 215 all-in-one mono laser printer can continuously copy up to 999 pages and it offers a 600 x 600 dpi resolution output. The Konica Minolta Bizhub 215 monochrome multifunction printer can handle media as large as a ledger or A3. The Konica Minolta Bizhub 215 A3 monochrome MFP printer comes in black and has a flatbed scanner on top and paper trays at the bottom. The control panel has function buttons and an LCD display plus a USB port for thumb drives at the side. The Konica Bizhub 215 has a print and copy speed of 21 ppm and it has a maximum paper handling capacity of 1,350 sheets with optional trays. The Konica Minolta Bizhub 215 does not require a PC to scan. The Bizhub 215 multifunction printer can also print directly from thumb drives. This unit can handle A3 media and can deliver good quality output. With Ethernet, the Konica Minolta 215 laser printer can directly send to and print from connected networks or computers. The Bizhub 215 black toner is very economical and ensures that high quality black and white prints are produced at a surprisingly low-cost. The duplexer and the automatic document feeder as well as Ethernet are optional. 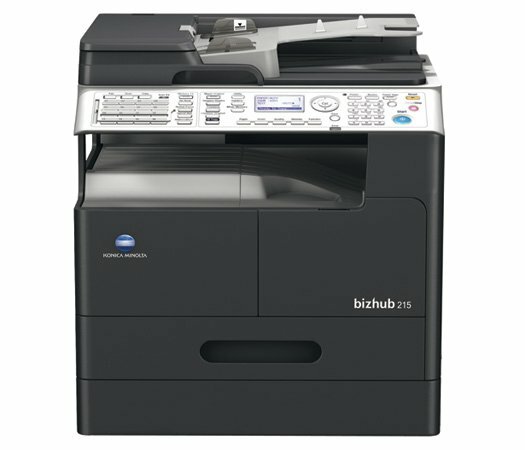 The Konica Minolta Bizhub 215 black and white office printer has a slow print speed and can only work on Windows operating systems.